These classic cars and trucks are great conversion starters! Whether it's a fond recollection of a first car, the memory of a grandparent's vintage ride, or just an appreciation for the wonderful lines and colors of classic vehicles, everyone has a car tale to share. 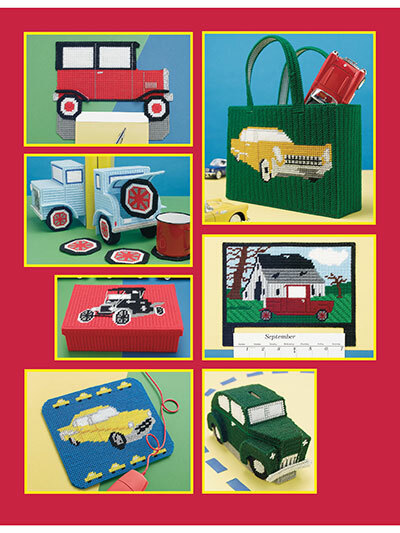 Choose your favorite from eight designs including Bookends and Coasters, Luxury Car Tote Bag, Calendar Toppers, Auto Mouse Pad, Model T Box, Classic Coupe Band and more. 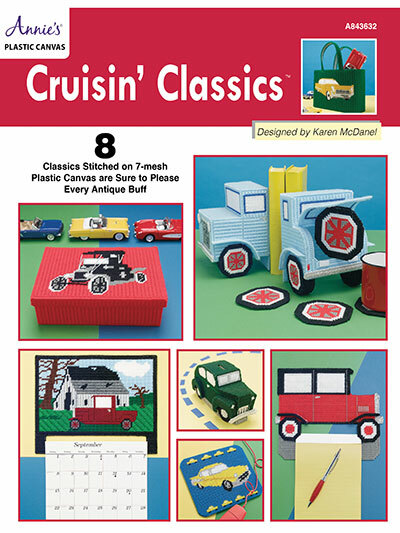 All are made with 7-mesh plastic canvas and range in size from 4" to 9" (bank) to about 7" x 10" (tote bag). I am making this for my husband for Christmas. Uses - loose change, paper clips, etc. He loves cars and I think he will like this.